The best part of buying a new home is easily the feeling of possibility. The world feels wide open again and full of potential. This new home holds the potential for a new life, new chances, and new opportunities. Just thinking about all the future memories this home will hold is enough to make me downright giddy. This feeling of possibility and potential extends well past everyday life and into the exciting realm of home decor. As I walk through each room I feel its unique potential...this will be the dining room where we have nightly dinners and host birthday parties...this will the office where I may launch the next phase of my career...this is backyard where we will spend every mild sunny spring afternoon. I think of all the different pieces that will serve as the backdrop of our lives and it's exciting, but so overwhelming at the same time. Since i'm not an interior designer nor do I have a million dollars at my disposal, i'm definitely working with some challenges when it comes to finding the right pieces. I have a very strict house budget and a significant other, who only requests that each piece be roomy, comfortable, and tall since he's 6'4 (not just stylish). You'd be surprised how hard finding TALL furniture has been! So far, we've purchased a couch, dining room table, side tables, fridge, and a media center. In the living room we hope to include 1-2 chairs to accompany our massive great room style couch. The living room will be the main hub of the house, so in addition to being ridiculously comfortable and approachable we also want it to be stylish. Our walls are a warmer mid-tone grey and we have white crown molding that pops against it. I love the brightening effect of the white on grey, so I definitely want to keep the furniture on the lighter end. For example, our couch is a very light grey (there's no way our couch could've been white or cream since it will be getting the most traffic and have the most exposure to potential stains). I'm planning for the living room to have subtle accents of white, gold, and blue/turquoise/teal. I would say my "style" is mid-century modern meets glam meets farmhouse. I like things to be beautiful, but versatile and interesting. I really want to live in my house, you know? I'm looking at these chairs as having the potential to provide that interesting visual pop to the room, while being plenty comfy (and not too dainty). 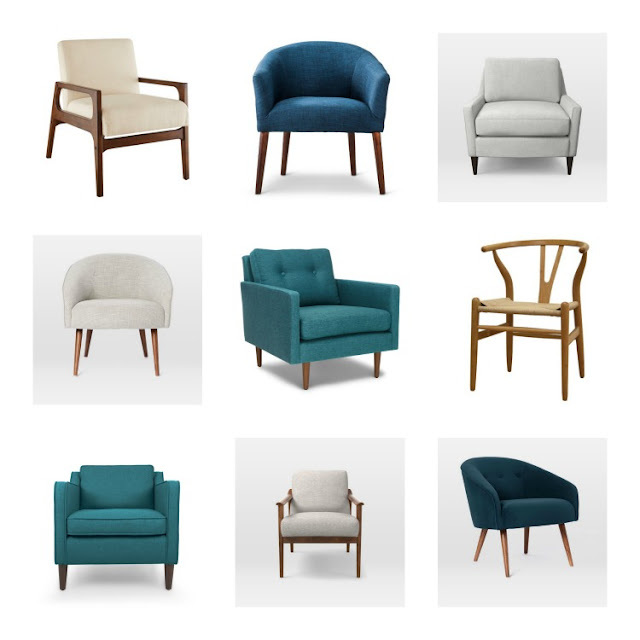 Above, I've rounded up few chairs that I've been eyeing across the web. Every time I think I have a favorite, I go back and reconsider. If I go neutral with the chairs, I will likely depend on accents like rugs and pillows to pull in the colors I'm hoping to achieve. If I get a colorful chair, I will likely go much more neutral on my accessories. It's a balancing act for sure! I know it's hard to judge these chairs without the context of the surrounding room they'll reside in, but I love a good gut reaction. Are any of these chairs the clear, standout winner? Also, do you have any great resources for finding the perfect affordable, stylish, comfy, tall chair? Let me know below in the comments!